GReddy Magnetic Oil Drain Plug - Pann Auto Performance - San Diego largest aftermarket automotive performance parts - What do you drive? The GReddy Magnetic Oil Drain Plug is a powerful 5000 gauss neodymium magnet. The Neodymium magnet is one of the most powerful magnet on the market. 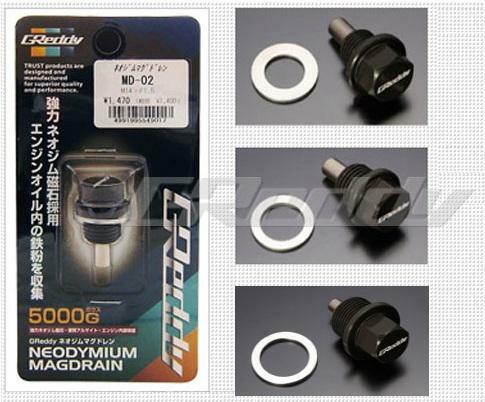 The hard anodized aluminum drain plugs are available in three popular sizes to match most Japanese vehicles. By using the “GReddy Magdrain” plug, you can help reduce the amount of abrasive materials in your engine, while extending the life of your engine.